Wanna shred? 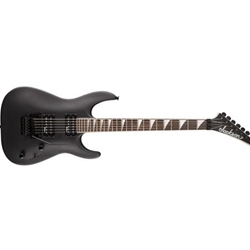 The Jackson DK2MQ Pro Series Dinky solidbody electric guitar is what you need. From its gorgeous quilt maple top to its dual Seymour Duncan humbuckers, the DK2MQ is a premium rock machine. The lightweight alder body is easy on your shoulder, and you'll adore the maple Speed Neck with its played-in oiled finish. This 24-fret beast lets you solo into the upper stratosphere and rain down metal mayhem upon the masses. If you need a guitar that is ready to rock with the best of them, the Jackson DK2MQ Pro Series Dinky is for you. What makes Jackson the solidbody electric guitar of choice for so many players? Start with the neck: hard rock maple with a comfortable, fast carve - it's joined to a compound radius fingerboard and optimized for blazing leads and massive chords alike. Jackson guitar bodies are designed with killer tone and eye-catching looks in mind, providing distinctive body shapes while staying lightweight enough to play all night. Wanna talk tone? this Jackson DK2MQ Pro Series Dinky is fitted with Seymour Duncan humbuckers that deliver a huge sonic palette - from bell-like chime to fat 'n' snarling.